So how are you going with your money saving? We are almost at the end of the 1st month so hopefully you have made a few changes to your household budget and have managed to save a buck. Most of us kindred spirits love similar things so I know that you will understand my love of pot plants. 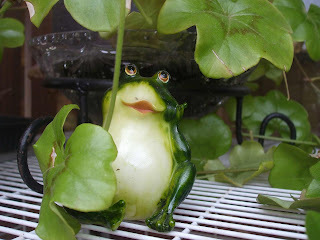 I like to decorate my pots with little critters and play Espy with Tommy when he comes to visit - He has a real fascination for frogs so this is one of his favourites. Most of my pot ornaments have been picked up at garage sales and markets really cheaply (usually around 50c) - They often have a small chip which makes no difference to me as they are just an ornament. I think they look lovely in my pots. 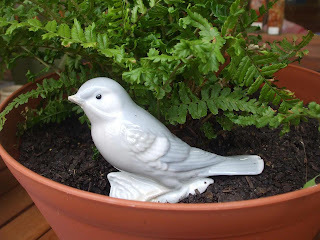 Garden decoration can be done so cheaply - Keep your eye out next time you are browsing through a Trash & Treasure market you never know what you might find. If you are looking for local markets in your area check out the Markets & Fairs Web Site for upcoming events. 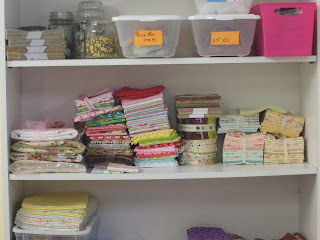 Whilst out and about also look out for plastic tubs with lids which can help you "file" your left over fabric scraps. I have lots of little containers full of Bindings, Charms, Strips, Panels, Pellon, Plain Stitchery fabrics etc Just label them and start your filing. I try not to waste anything and cut most of my scraps up - Those that are an odd shape get put into an extra large tub to be used for applique. 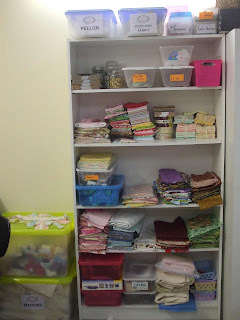 I also put some of my long term projects into it's own tub so that everything is kept together and also so that the fabric doesn't get accidentally used for something else. Talking about projects I have started making my Yo Yo's for my Yoyoville Quilt. All of my Beach House has arrived from the Fat Quarter Shop and after gushing over it for a few days I finally took to it with the rotary cutter and made a start. Yo Yo's are great to make whilst watching telly - No thought needs to go into them and they are just so cute !! Even "Eva" got in on the act - This will be the next pattern release from Mothers Cupboard - I wonder what it could be? I am making progress with my "Birds of Happiness" quilt. 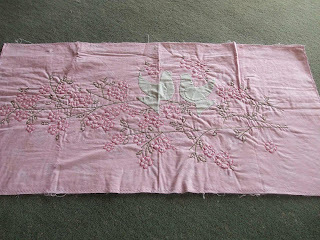 Just a few more flowers to stitch now and then I can piece the border. I am using another Robyn Pandolph range for this "Somerset Cottage" I am making it to hang on the wall above our bed. 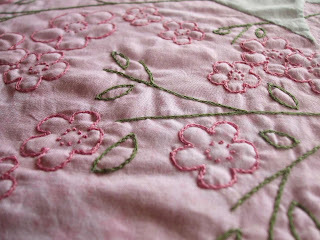 I have really enjoyed stitching this. Look what arrived in the mail today! 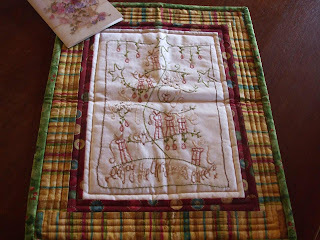 A gorgeous Christmas Stitchery expertly stitched by the lovely Peg. It was a thank you gift for co-hosting the 2009 Advent Swap. It is just so lovely and a beautiful gesture. Thanks so much Peg. Blog land is such a fantatsic place and I have been lucky enough to meet some wonderful people. Jo who co-hosted the swap with me has become a wonderful friend, stitching and coffee buddy. I have also made some lovely friendships via e-mail and the telephone. All of my Gum Nut sisters are just like "real" sisters. It is very hard to explain the bond we have all formed in such a short period of time but we are all very much "kindred spirits" and get along famously. We hope to meet up in person in 2010 - That will be so much fun. One of my fellow sisters, Jenny, and I have so much in common. We have the same philosophies about life, love, family and stitching. We like the same things - shabbiness, fabrics, books.... the list goes on. 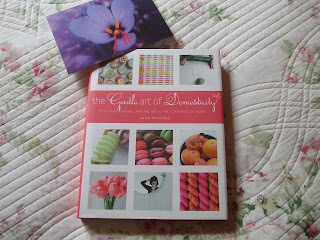 Jenny sent me this book a few days ago "The Gentle Art of Domesticity". I have started to read it and it is just fantastic. It is about making a house a home, the difference between domestic chores and the domestic acts of cooking, home decorating and all of the simple things we love. I will cherish it forever as it is very much "me" and reflects how I feel about my home and family. Before I sign off I wanted to start to address some of the requests that I have had about ways to save money. One of my followers asked about ways to save money looking after our pets. I have cats and dogs and I don't like to feed them commercial "canned" food. I developed my own "meat loaf" style diet for them quiet some time ago and all of them just love it. It is full of goodness and does not upset their tummies like the canned versions. I also feed a good quality biscuit to ensure that they are getting a healthy balanced diet and have something crunchy. Put all into a boiler and mix together to make a raw broth. Cook on a low setting for around 3/4 of an hour (or until cooked). 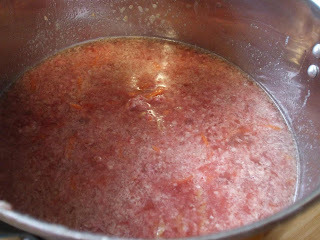 Allow to cool and then place into containers to refrigerate or freeze (I use recycled ice cream containers). The liquid will solidify making a nice firm mix once it is cooled. My animals adore this mix. It is very economical to make. Most butchers sell a "Pet Quality" Mince mix very cheaply - Ask about it next time you are there. Have a lovely weekend and I will talk to you next week. Love your pet food recipe I think my boys might like that....Your Birds of Happiness is gorgeous...so pleased you liked the wall hanging...you and Jo did a fabulous job with the Advent Swap. Your a girl after my own heart,looking for bargains, and ways to brighten up your garden, and pots. I often read your blog, but this is the first time I have posted.Lovely blog. I just love the stitchery that was gifted to you. 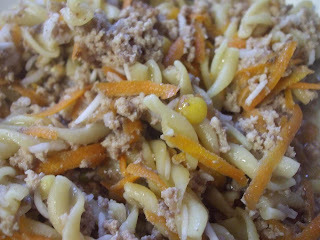 Love your stitcheries....I'm glad someone else makes their own pet food "mince"....mine is chicken mince, mixed vegies, brown rice and a pkt of pasta, my staffy just loves it...cheap too! Love the colours of your yo yos. The Birds of of Happines is stunning and can't wait to see more. I reckon Lucy would love that mix I'll give it a try. GREAT pet food idea - thank you. Really like what you are doing with your bog. Well done. I make my two dogs homemade food too...almost the same recipe, but I add chicken...Needless to say they love it. They are spoiled rotten. 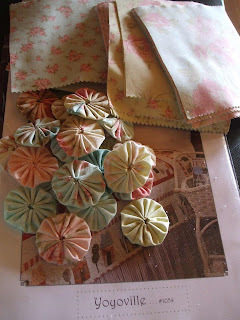 Those yo-yos are so fun for a change of pace, and I always love the fabrics you use. That is the 2nd book I've seen Jenny recommend and I can't find either! I try to buy in the US because of shipping charges. Love how you take such care with your pets. 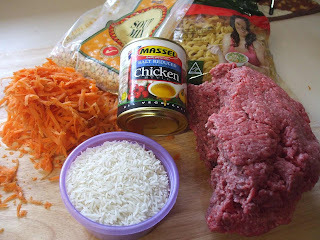 Your dog food recipe is very like the one I use and saves lots of money as well as being healthier. I have grated zucchini fresh from the garden and sweet potato as they are very good for humans so i thought they would be good for the dog as well. 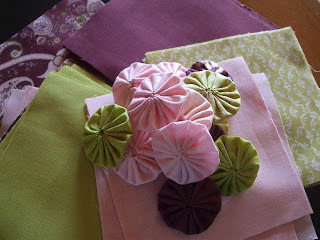 love the fabrics you are using.